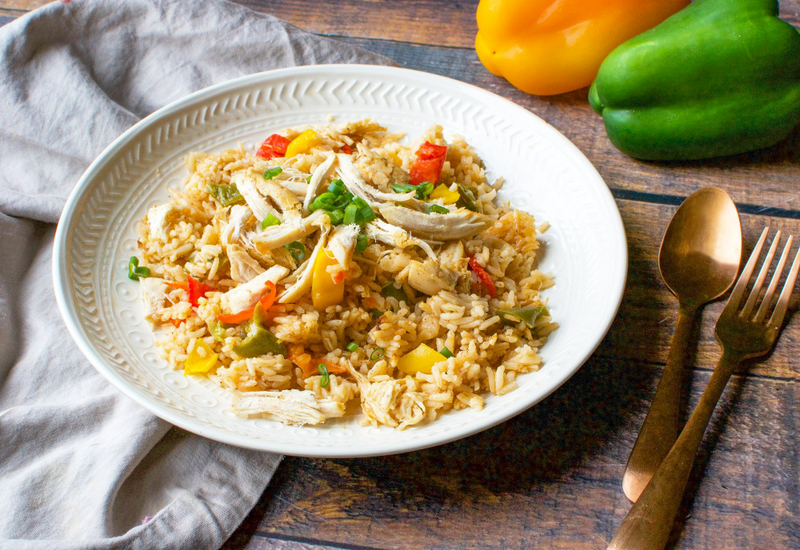 This one-pot Cajun Chicken and Rice is a quick and simple way to deliver a bold and spicy weeknight dinner everyone will enjoy. The pressure cooker makes quick work of perfectly seasoned chicken breast, vegetables, and rice in a tomato-accented broth. In this recipe, garlic powder, paprika, oregano, thyme, cayenne pepper, and white pepper come together to form your own signature Cajun spice blend. No one will believe that this classic Southern recipe is ready to serve in half an hour. Plus, this dish is gluten-free and dairy-free so no matter who shows up for dinner, everyone can enjoy it! Season chicken with garlic powder, paprika, oregano, thyme, cayenne pepper, white pepper, and salt. Cook and stir onion in hot oil until softened, about 4 minutes. Stir tomato paste with the onion to coat. Stir rinsed rice, celery, and bell peppers with the onion; add seasoned chicken. Pour remaining broth over the chicken mixture. Remove chicken breasts to a cutting board and shred with two forks. Stir shredded chicken into the rice mixture. Have you ever heard of the "holy trinity" in Cajun cuisine? This is the name given by Cajun chefs to the aromatic vegetables that have become the signature of the cuisine: green pepper, onion, celery. They are roughly chopped and combined in traditional dishes. This method is similar to the use of the mirepoix in traditional French cuisine. Per Serving: 325 calories; 8g fat; 22.7g carbohydrates; 39g protein; 99mg cholesterol; 633mg sodium. This was super yummy! I love the Cajun-inspired flavors. The cayenne and white pepper really turn up the heat in this dish. Cooking everything together in the pressure cooker make even the plain white rice super flavorful and delicious. I always add extra chicken for my husband, he loves it! We used chicken thighs in this Cajun dish and it was really good. A lot of really good flavor, and the chicken was nice and moist. The seasoning was perfect, exactly like my favorite store bought Cajun spice blend. The best part is the convenience of the pressure cooker! Found this while looking for "Cajun" and "Creole" recipes that didn't use "Cajun/Creole Seasoning" because we had run out & I was craving. I found the flavors to be balanced, if a little underseasoned. That is what hot sauce is for, though . . . am I right?! To make this dish I just used Cajun seasoning that we had in the pantry, and added sliced okra. It was quick and easy, perfect for crazy weeknights. I loved it! I chanced some of the veggies to make it the way I like it and it’s so versatile that way! We like the recipe. We have done a few minor tweaks to suit our tastes. First, we substituted the seasoning with prepared mild cajun seasoning. We sauté the chicken on both sides (3-4 minutes) pull the chicken, then sauté the vegetables. We then add another 1/2 tsp of seasoning the the vegetables, broth, and rice before adding the chicken back into the cooker. We made this tonight according to the recipe and it was fine, but it could be much better. Next time we will double the seasonings, add a can of Rotel, some smoked sausage, and maybe shrimp (after cooking on sauté). Also, we think brown rice might be a nice switch from white rice. Great base recipe though. Easy and tasty! Needed a little more spice/seasoning for me but a few dashes of hot sauce and it was perfect! I listened to some of the other reviews and nearly doubled the spices but the meal was still on the bland side and I had to add quite a bit of salt to give it any flavor. Also I’d find undercooked rice every few bites or so even though I followed the recipe exactly. Apart from that it wasn’t bad and very edible for the whole family and a good starting point for any chicken and rice dish.